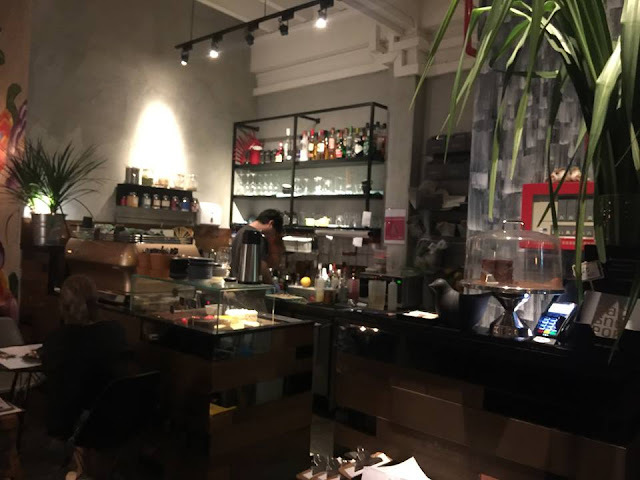 CreatureS is a crowded modern-day café set in the culturally rich conservation area of Desker Road. They serve soothing comfort food inspired by Asian flavours. The owners of CREATURES have reinterpreted favourites and jazzed them up for an Asian flair for over 20 years. After moving into their new home, they combined their love for cooking, flowers and interior design and gave birth to CreatureS. According to CreatureS, their signature chocolate cake "comes home a tad bolder, smoulderingly sexier, so dark and luscious it borderlines being intensely vulgar. A dark decadent hearth of sponge soil wrapped with glistening velvety bittersweet chocolate fudge and laced with light pink sea salt - all to be dredged through an endless deluge of coconut ice-cream madness. If you ever want to feel how perfect life is, this is pretty much life- changing." Description aside, the chocolate was a little too thick for my liking and the coconut ice-cream melt too quickly. That's because the chocolate cake and the plate was warmed— a better idea would be to place the ice-cream on top of the sliced cake or place it on a separate, cold bowl. The whole cake excludes ice-cream. You can also get an additional ice-cream (Lychee + Coconut + Vanilla Bean) at $4/scoop when dining there! You can also ask for birthday candles there! As you can see, the microfoam has many bubbles foaming on the top. Although the coffee was smooth and easy to drink, it didn't look as appealing because of the pixellated latte art. It actually looks like a carbonated drink! Perhaps the barista can shorten his or her stretching for a smoother foam. The Orh Nee Cake looks battered and bruised without well-defined layers. Aesthetically, the slice seems to be mourning. I don't think it is a great depiction of the yam/taro flavour as the flavours were masked by the coconut shavings. They should call it "Coconut cake with a hint of taro" or something. Launched on 17 Feb 2017, this Garnet Precious Gem Stones is eye-catching but not very tasty. If I'm not wrong, the precious gem series seem to have been removed from the menu (couldn't find it on their website or social media). Garnet is one of the trio that was launched— the other two was Amethyst and Jade. All of us took only one spoonful and did not continue after that. Somehow, the taste was rather strange— creamy without any identity. Service-wise, the cafe was packed on a Friday night at 9pm. It seems challenging for the service staff to walk up and down the stairs with the desserts. It was also difficult to catch the attention of the service crew. I really liked the ambience of the cafe though. We were seated on the second level balcony that had fairy lights and beautiful decorations. However, people kept walking in and looking at the outdoor area— it sure made me feel like an animal in a zoo as they'd look at what we were doing! If you want more privacy, this is definitely not the area to go to. The toilets were also quite dirty but it might be because they were closing soon. Parking space is also limited, and we had to park at Mustafa to walk over to the cafe. Tuesday / Wednesday / Thursday / Sunday: 12.00 noon –10.30 p.m.
Last Order: Lunch – 3.30 p.m. Dinner – 9.00 p.m. Bar – 9.45 p.m.
Friday / Saturday: 12.00 noon –11.30 p.m.
Last Order: Lunch – 4.30 p.m. Dinner – 10.00 p.m. Bar – 10.45 p.m.